Sometimes,the computer will pop up for some error messages to help us find the problem, but these messages are only computer specialist to understand it, as normal computer users how to use these error messages to solve the computer problems ? 1.Download error message for window software,then copy and paste the error code,the related explanation will show you. 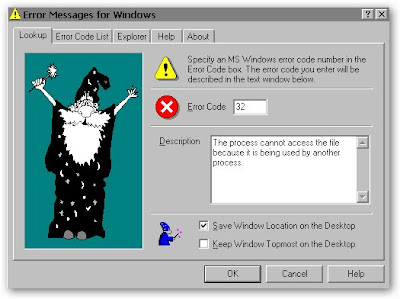 The first letter of the error messages is “p”, so click on the “p”, it has found a explanation message for this error message. Hope that the above two websites and free software can help you solve some computer problems.